The nausea kicked in full-force on Wednesday, so I haven't been able to do much other than the most basic things since then. That means I haven't been taking pictures or writing much. I thought that today, I'd share with you a glimpse of our Sunday, which was spent at home, outdoors, enjoying the beautiful weather. Our neighbors up the street have a wooden train in their front yard. It's actually left over from Christmas, but they haven't moved it yet ... and quite frankly, our boys would be happy if it just stays right where it is! I sat in the cul-de-sac and watched them play in it for about 15 minutes ... they were smitten with it. They really wanted to climb all over it, but I tried to discourage that as best I could. I finally gave them a two-minute warning, and then we headed back home. Once we got home, they immediately picked up some pool noodles and started sparring. I mean, gosh! Isn't that what we would ALL do? Don't EVEN try to insinuate that Jake can't keep up with the big boys. Honey, he's RIGHT IN THERE, swinging his noodle around with the best of them. They're careful with him, but honestly, he holds his own pretty well regardless. Grayson was hard at work up in the corner of the backyard, trying to carve out a bunch of undergrowth to plant a garden ... and I really wanted him to trim out this tree, because I was convinced it could be the perfect small climbing tree for the boys. And it is! 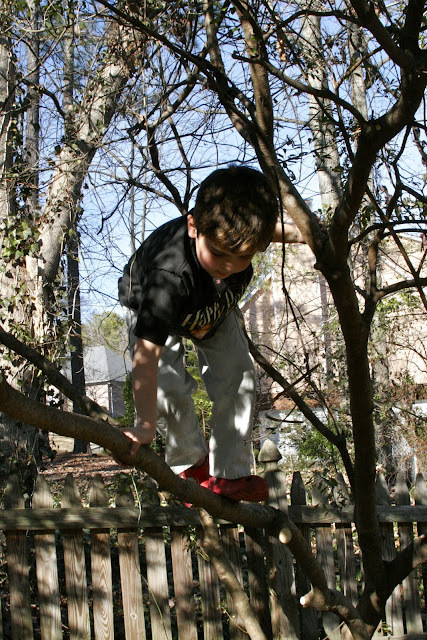 Jake isn't quite adept enough to do much tree climbing, but I'm sure it won't be too long. Nathaniel couldn't WAIT to get up in it and climb around, and he did a great job. He's so happy to have a tree to climb in our yard! All of our other trees are way too tall and don't have branches close to the bottom of their trunks. This one will be just perfect. 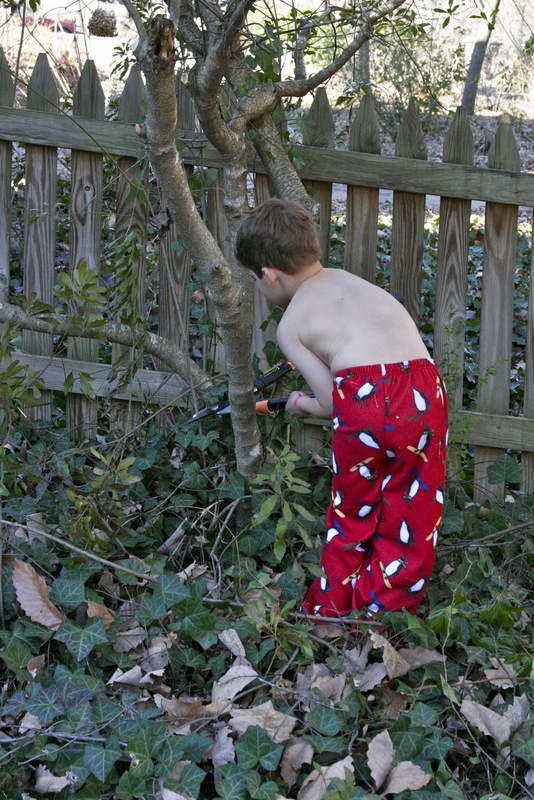 Nicholas was too busy helping trim the bushes and trees to begin climbing ... he was THRILLED that he had some hedge trimmers to use. He took his job very seriously in order to be allowed to assist in the future. And now for the "fair warning" part of the post ... I've really started feeling the nausea now. And even though I have the Zofran now, I'm still really struggling. So there's probably going to come a time when you click over here in the morning and there's nothing new. And that might happen for several days in a row ... maybe longer. I just can't say how this is going to shape up this time around. I'm setting up posts in advance while I still can, but that won't last for long. I hope you guys will stick with me while we go through the next few months of sickness ... I typically start feeling better around 19 or 20 weeks, so it won't last forever (although it will feel like it to ME). Please just keep us all in your prayers as we get through this time! I feel your pain... I was on Zofran for a while too and it only really took the edge off. I still felt awful. I'm doing a little better now though- still have a few moments here and there. Hope you feel better soon! I know there is really nothing that helps! Keeping my fingers crossed that things ease up for you soon. Pregnancy is touch, but it's worth it! Hope it won't be too bad. I could never take the prenatal vitamins because they would make me sick. I told my OB that it was because they were blue and I really wanted a girl! Hang in there, you know it's worth it by the end of the 9 months! I never had it that bad but you do have my sympathy. Glad you're feeling better, Lacy! Thanks, Amy ... you're right, it's totally worth it. Just hurts right now! Laura and Rachel, thanks for your thoughts! Beckie, I can't take prenatals, either. I'm just taking prescription folic acid, which is a tiny little pill. Sherry, I know! If we have a girl, she'll be the most well-protected girl in the state! Three brothers ... ha! Liz, thank you so much. And yes! Keila is so talented!